Coming Soon: Brown [Treesnake] Bag Presentation at 12 noon on Thursday, September 27, 2018, US Fish & Wildlife, Pacific Islands Fish & Wildlife Office (PIFWO), Conference Room 3-127, Prince Jonah Kuhio Federal Building, 300 Ala Moana Blvd., Honolulu, HI 96850. Attendees should join 5 to 10 minutes prior to the start of the conference. Click the Virtual Room link below to join the Vidyo Conference. If you do not have Vidyo on your computer you will be prompted to download and install it. After installation, close the login window, then click the link again. 43699912690 select Fisher, Joshua’s room and hit join. Please use VidyoDesktop to connect, If VidyoDesktop is unavailable, please contact ifw-vidyosupport@fws.gov for dial-in instructions. Please mention Fisher, Joshua as your destination. For support, please contact ifw-vidyosupport@fws.gov, or call 703-358-2450. Snake with yellowish to dark brown back, sometimes with mottled bands. Underside is cream to yellow colored. Night-active, lives mostly in trees, although frequently seen on the ground. Native to the South Pacific including the Solomon Islands, New Guinea, and Northern Australia. Believed to have been accidentally introduced to Guam in the 1940s hidden in cargo. On Guam the population of brown treesnakes is not controlled by predators, diseases or competitors as it is in the snake’s native range. The current population estimate is about 50 BTS per hectare. BTS eat birds, bird and reptile eggs, lizards, small mammals such as rats and mice, and even small household pets. They are responsible for the extinction of 9 of 13 forest bird species and three species of lizard. Other species of birds have been reduced to very low numbers and seabirds such as terns, noddys and shearwaters no longer nest on the island. In the absence of preferred prey (birds, small mammals), BTS have switched to feed on lizards and skinks, which reproduce faster and are able to sustain the snake population at abnormally high levels. Ecological impacts of the absence of birds and lizards (largely insect-eating species) include a rise in the abundance of insects, which may affect crop production. The brown tree snake causes frequent electrical power outages by climbing power lines and getting into transformers and electrical boxes. Snakes have caused more than 1600 power outages in the 20-yr period of 1978-1997 and most recently nearly 200 outages per year. Costs to the island’s economy have exceeded $4.5 M per year over a 7-year period without considering transformers, and damages inside electrical substations. Not known to be present in Hawaii at this time, although a total of eight brown treesnakes have been found live or dead in Hawaii between 1981 and 1998. All snakes were associated with the movement of civilian and military vehicles or cargo from Guam. No special searches were conducted for cargo or crafts as they were leaving Guam or arriving from Guam in Hawaii prior to the 1980s, as the problem on Guam was still coming to light. 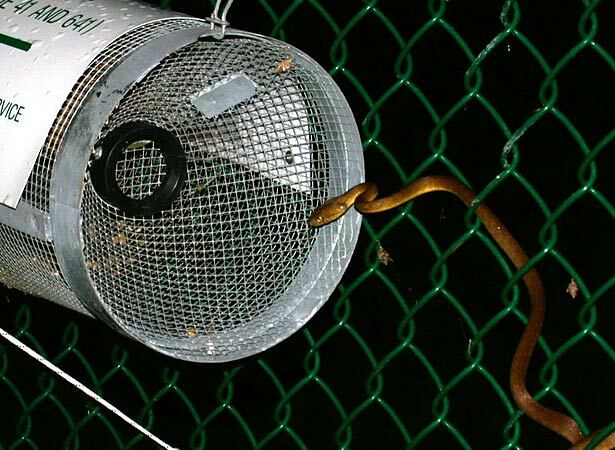 An economic study by the University of Hawaii estimated that the introduction of the brown treesnake to Hawaii could cause between $28,500,000 and $405,000,000 annually. A new assessment by the USDA National Wildlife Research Center puts the actual cost of BTS at $1.7 billion per year if introduced to Hawaii. If you see a snake, call 911 or 643-pest immediately!